We live in such a horribly messed up world! This world is full of so much anger and hate! People hurting people (emotionally, physically, spiritually, completly)! It breaks my heart to think about it! 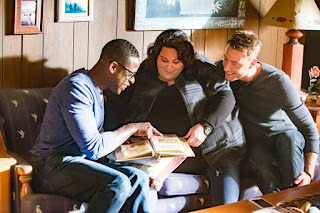 But here's the thing...this new show on NBC called "This Is Us" is something that can really move people (in the heart)...make people think...and could actually cause some positive changes in the way people think. This SHOW deserves so many awards! Because the show shares each of the characters vulnerabilities & insecurities (we all have them). It shows the character is not perfect, has quirks, has strengths and even has a need for one another. Even the lonliest people need something that this world is lacking MOST right now... LOVE...and lots of it! "Do you guys realize why This Is Us is such a great show? One that people all over have fallen in love with? Because the stories that they share not only show human vulnerability...weakness...faults...but SO MUCH LOVE! And we honestly live in a world that is LACKING so much of it! It's hard to put into words, but I think I realize that despite the struggles of our lives (and we all have plenty...and different types), what really MATTERS...deep down...is LOVE! Especially the LOVE of family! It's the best, deepest, truest type, given from the deepest parts of our souls. I just love this show... *sniff* *sniff*"
Anyway, I am just overwhelmed with emotion every time I watch this show and I know I'm not alone! But it's always honestly, in the purest, deepest, best sort of way! It grabs my heart, grips it and squeezes the tears right out of my eyes almost every single episode! So all I'm saying is...WATCH THIS SHOW! Start at the beginning...because you need to watch every single episode of this show to understand and grasp the deepness of it all. What the world needs is LOVE! More love! But with that being said, more than anything, we need to realize that most of the LOVE we truly need starts at home...in our family...with the ones who go through all the good and bad times with us! WATCH IT! You'll thank me later! If you're already watching it...let me know your thoughts below! I was not paid to feature this post! I was not compensated in any way by posting my honest opinions about this tv show.